She quickly wiped away her tears and ran to her classroom. I saw her again crying in a corner of the classroom. Her classmates were outside playing so I asked them about her. They did not know anything, so I went to the classroom and sat beside her and hugged her. The way she was crying upset me and the only thing I could think to do was put my arms around her and lend a heart to share her pains with. She was crying so loudly that my friend Zamira and I felt like our breath was taken away and we began to cry also. It felt like the only thing we could do. We could cry and not argue with her. I understood then that “stranger” is not a word between females. The pain in our hearts is the same and we are all familiar with it. I learned the girl’s name was Nasima and she explained the whole story. Her parents owed the old man a lot of money and could not pay him back, so instead they had to give the man their two daughters. At the time of the agreement Nasima and her sister were very young and the man said he would get them when they turned thirteen. The man already had five wives. He had already married Nasima’s sister and he had beat her brutally and she died. The man apparently said the girl had misplaced two thousand Afghani. She said none of the other relatives said anything. Now it appeared that it was Nasima’s turn to go and die also. Our traditions and beliefs have one rule: “Cry and do not argue.” Death becomes the only way out of such pain caused by our elder members, relatives, and the rules. I wish we could avoid sitting beside the corpses of our sisters, marrying at any age that parents choose for us, working as slaves and being treated as property. 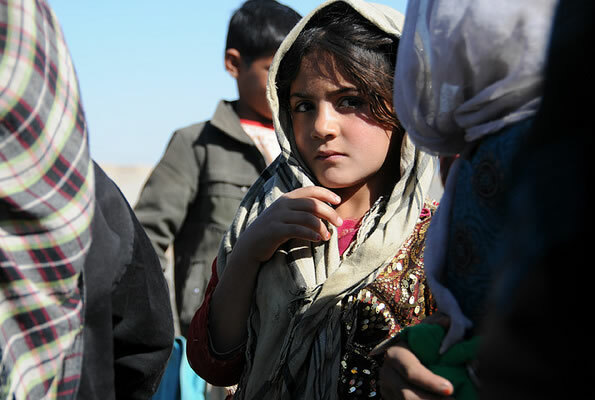 I wish I could tell even a portion of the pains and problems of Afghan women in my writing. I wish I could protect Nasima by taking her in my arms, and break tradition. I wish I could protect my sisters and women in my country. It is as if women are surrounded by wolves at the top of the mountain without a weapon. The only escape is to throw themselves from the mountain and die. I wish this was just a chapter in a novel but it is a true story hidden by so many girls, not to be edited and changed. I wish this did not have to be felt by a girl who is thirteen. U.S. Navy photo by Lt. j.g. Matthew Stroup. This piece has also been published on Women’s eNews. Arifa – Thank you for sharing this and giving Nasima’ a voice. That was brave and generous of you. You write with such clarity and heart, and how I wish you did not have to write about this because it was not happening. You are in my prayers. Thank you for sharing this story with us by giving us a glimpse into the difficulties of being born female in Afghanistan. But when you said ” I understood then that “stranger” is not a word between females,” you speak a deep and important truth. Like Elisabeth, I was really struck by your line, ” I understood then that “stranger” is not a word between females. The pain in our hearts is the same and we are all familiar with it.” And then later when you added that Nasima’s sister had died while married to this man and after being brutally beaten, I really thought to myself that this is the kind of cruelty that when I was a child only appeared in the darkest folktales, the folk tales that had not been cleaned up for modern publication by the Brothers Grimm. So I just feel like all you women, you women who know each other’s intimate lives even before you speak, I think you all need to form a sisterhood, a sorority we call it here, and have really strong members in this club that is only for women to be together and to be sisters together who love each other and take care of each other. There needs to be a sorority pledge where you pledge yourselves to the sorority and to each other, to love and to protect and to help prosper. So cry and do not argue but also just get up and leave and go to live with other women. This girl’s sister was murdered and she was being made to marry the same man! That is criminal. Also, child marriage is a crime. So, use lawyers to get the laws enforced. Take up collections among friends and students to fund the legal campaign to defend Nasima’s rights. I know this is creative writing, but I cannot bring myself not to also talking about creative solutions. Because, to the extent that we can believe in this girl-bride, to that same extent we NEED to be able to visualize solutions and bring them to fruition. And yes, we believe in Nasima and we believe she is suffering criminal acts. Love and Peace for you, great writer!